For as long as they can remember, Zinnia, 13, and Lainee, 12, have done everything together. Born in China to separate families, the girls were both diagnosed with a genetic blood disorder called beta thalassemia, which causes severe anemia, poor growth, bone deformities and damage to organs if untreated. The two were orphaned at a young age and bonded during monthly blood transfusions to treat the disorder.. The Children’s Research Fund is made up of more than 70 talented and energetic board members who unite in advancing our mission: support for pediatric medical research at the Stanley Manne Children’s Research Institute. For more than half a century, the men and women of the Children’s Research Fund have remained true to the vision and commitment of its founding members. The Children’s Research Fund is guided by the principle that there is no higher calling in science or philanthropy than eradicating the suffering caused by debilitating disease and birth defects. The Children’s Research Fund promotes awareness of its mission through vigorous fundraising, education, outreach activities and an annual showcase gala event, The Children’s Ball. Over the years, the group’s renowned charitable efforts have generated support from individuals, corporations and foundations throughout the nation, raising more than $117 million to advance medical research. Additionally, we are fortunate to have a thriving junior board, with 75 members made up of young professionals in the Chicago metropolitan area. The Children’s Research Fund, was established in 1951 for the sole purpose of raising funds to advance medical research. 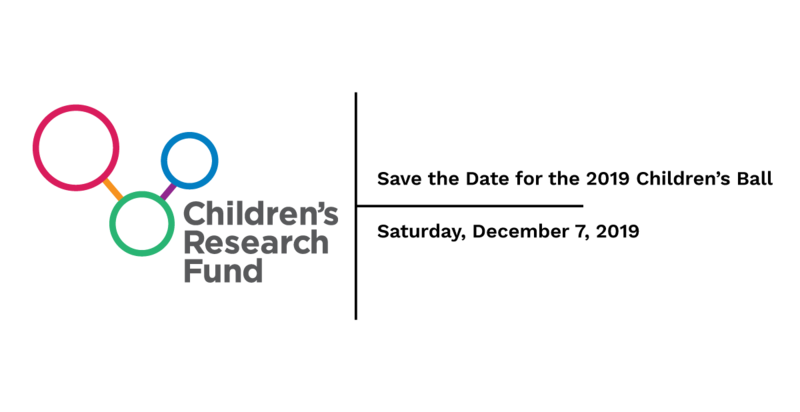 In 1991, the Children’s Research Fund began its affiliation with Ann & Robert H. Lurie Children’s Hospital of Chicago, formerly known as Children’s Memorial Hospital, and since that time has been a principal benefactor of the Stanley Manne Children’s Research Institute. The Children’s Research Fund promotes awareness of its mission through vigorous fundraising, education, outreach activities and an annual showcase gala event, The Children’s Ball. Over the years, the group’s renowned charitable efforts have generated support from individuals, corporations and foundations throughout the nation, raising more than $100 million to advance medical research. seeks to answer fundamentalquestions about health and disease, including medical conditions, human development and genetics. Some particularly promising research is being done on the role the microbiome plays in regulating our immune system and protecting us against disease-causing bacteria. led by Susanna McColley, MD, seeks to find the best medicines, devices and other therapies for specific conditions. Last year, Lurie Children’s had 550 open clinical trials, for conditions ranging from cancer and epilepsy to muscular dystrophy, cystic fibrosis and food allergy. seeks to inform health-care decisions by providing evidence on the effectiveness, benefits and harms of different treatment options, including how this varies from patient to patient, based on comparative research studies. looks at ways to translate basic research findings into medical practice and better outcomes, making the connection between the bench and the bedside. Advances related to gene sequencing, an early area of Children’s Research Fund support, has led to more information about the mutations that cause specific conditions. This allows clinicians to tailor medications to the specific mutation, observe the results in cell and animal models, and then refine the medication for optimum effectiveness. led by Matthew Davis, MD, MAPP, focuses on research that supports effective policies and practices to promote the health and well-being of children, their families and their communities. The Children’s Research Fund has led the way as Lurie Children’s longest-standing partner for innovative research, supporting the visionary researchers and physician-scientists at the Manne Research Institute since 1991.